Fast, easy and affordable small business payroll that integrates seamlessly with QuickBooks Online. 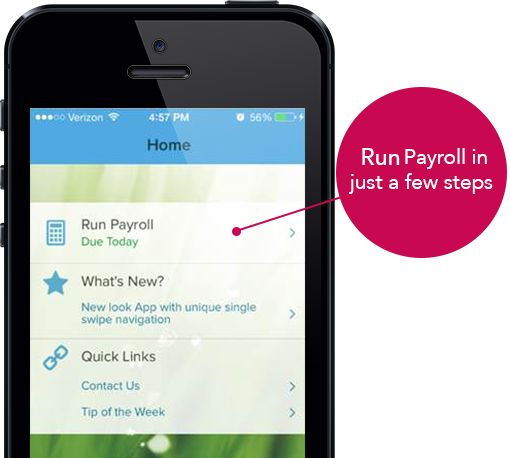 Already a RUN Powered by ADP® client? Have a cup of coffee and enjoy all the time you just saved! Spend less time managing payroll. Seamlessly integrate payroll and accounting data with QuickBooks Online. Are you a bookkeeper or other accounting professional? ADP can help generate recurring revenue for your practice through our flexible partnership options. And, with Accountant Connect℠, you’ll enjoy single-sign-on access to your RUN Powered by ADP client data, tax forms and loads of essential practice management tools to help expand your role as strategic advisor. your RUN clients with QuickBooks Online now. Access your Client's General Ledger on the "Dashboard"
ADP, the ADP logo, RUN Powered by ADP and Always Designing for People are trademarks of ADP, LLC and/or its affiliates. Accountant Connect is a service mark of ADP, LLC. All other marks belong to their respective owners. Copyright © 2019 ADP, LLC. All rights reserved.